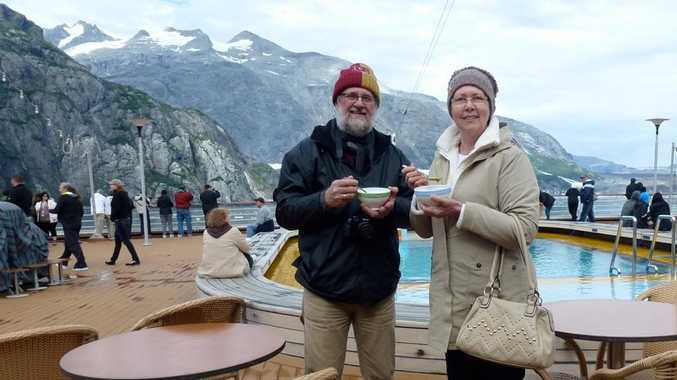 Lyall and Daphne Pohle celebrated their 42 wedding anniversary in Canada. Plans had been under way for four months deciding what to see and do on this holiday of a lifetime to Canada. Our trip included travelling on the Rocky Mountaineer then on to Alaska which coincided with our wedding anniversary. While in Canada we rafted down the Athabasca River and walked on the Athabasca Glacier, which was amazing. Luck was on our side because we actually saw a black bear in the forest. Cruising up through Alaska on the cruise ship The MS Volendam - a cruise ship with 10 decks, eight bars, two swimming pools, two hot tubs, a spa, and a show lounge - was amazing with views of snow-capped mountains, glaciers, pristine lakes, waterfalls and the wildlife. We went by train up through the White Pass in Alaska. The untouched natural beauty of Alaska left us breathless. Sometimes when we took pictures of the fantastic scenery it felt like it wasn't real. We dined a la carte that evening, then moved to the piano bar for drinks. It was a great way to remember our 42nd wedding anniversary and also to remind us of the love we still share for each other after 42 years. Everyone should see this most beautiful part of the world. We had our 40th wedding anniversary in Switzerland and are now wondering what to do for our 50th when it comes.